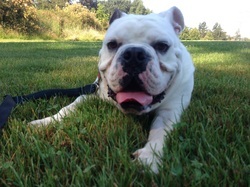 Duke is a 18 month old English Bulldog looking for his forever home. A little bit about Duke, he is very smart and loves all responses best to positive reinforcement training. So he will work for cookies no problems. He is 18 months old and a bit mouthy as he is at that teenager stage but can be easily redirect to do smarter activities. Duke would be best in a home that is active and includes him in their daily activities. He isn't a slow bulldog! Duke loves his people. He was cat tested on the weekend and did awesome and he has never lived with a cat. He is a rude dog greeter so he needs a little help with his doggie intros to new dogs. Yet he loves his flat face bulldog breed friends. Duke is neutered. Anyone wanting more details please head into the Victoria SPCA. Approved applicants will be provided with more details.